Signavio Workflow Accelerator is the first fully web-based workflow engine that runs in the cloud. Naturally, you need to be able to connect and integrate with other cloud systems. 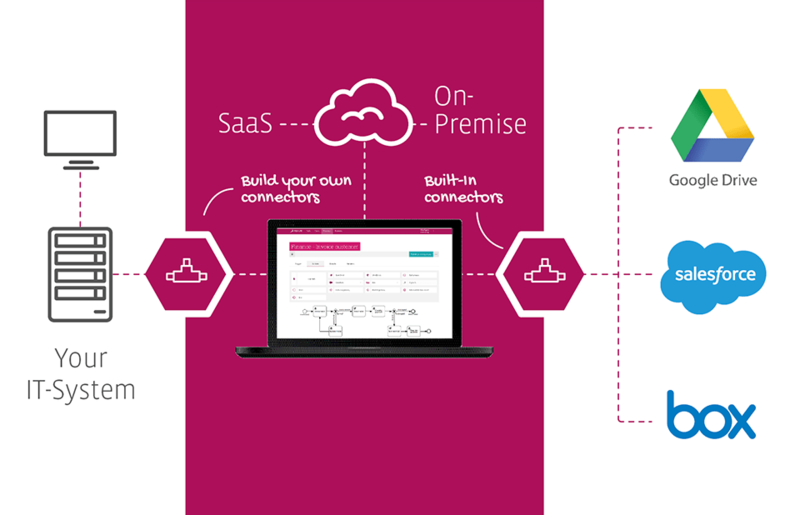 As a Signavio Workflow Accelerator user, you benefit from out-of-the-box connectors to systems such as Google Drive and Salesforce. Thanks to the integration using the OAuth security protocol, Signavio Workflow Accelerator users can use authorized Google Drive or Salesforce features without storing passwords in Signavio Workflow Accelerator. In addition, all access permissions set-up in the connected Cloud-System are transferred directly into Signavio Workflow Accelerator. The Salesforce integration allows organization administrators to configure automatic triggers. These triggers start your processes in Signavio Workflow Accelerator in response to events that you define in Salesforce. Once configured, the trigger can be easily used by the business users who create process models in Signavio Workflow Accelerator.